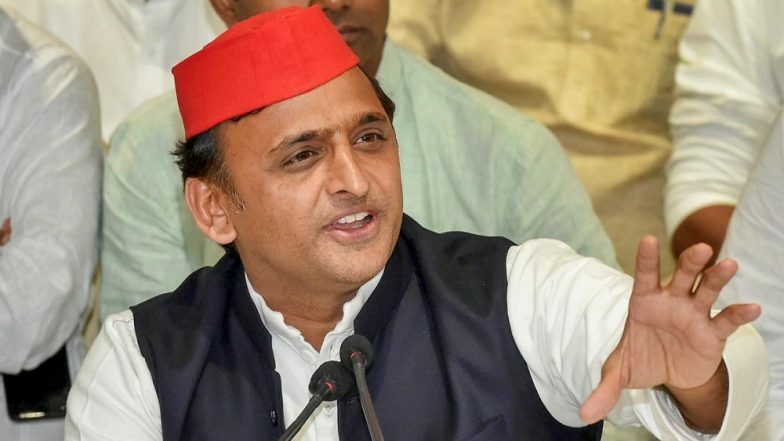 Lucknow, March 22: Samajwadi Party chief Akhilesh Yadav Friday said the sacrifices of the armed forces should not be questioned, but asked the government to "stop pretending to be the Indian Army". Hitting back at Prime Minister Narendra Modi for his attack on rival parties over the Pulwama attack and the subsequent IAF strike in Pakistan, Yadav also said that in a democracy it was a "fundamental right" to ask questions of politicians. "Politicians who say they cannot be questioned are dangerous," he said. Yadav's remarks came after his party colleague Ram Gopal Yadav came in for heavy criticism from the PM for alleging that the Pulwama terror attack was a "conspiracy" to garner votes. In a series of tweets, the PM also slammed Congress' Sam Pitroda for saying he wanted to "know more" about the Balakot strike and asking as to how many terrorists were killed in the operation. Lok Sabha Elections 2019: Akhilesh Yadav, Mayawati to Hold 11 Joint Rallies from April 7, Check Venue and Place. In his attack, Modi termed the Opposition "the natural habitat of terror apologists" and accusing them of "insulting" armed forces. Akhilesh Yadav's tweet came an hour after the Prime minister's. "The sacrifices of our Armed Forces should never be questioned. To ask questions of politicians in a democracy is our fundamental right. This government needs to stop pretending to be the Indian Army," the SP leader said. On Thursday, referring to the Pulwama attack, SP general secretary Ram Gopal Yadav had said, "This was a conspiracy...But, when there will be a change of government, investigations will be done and prominent people will come under the scanner, who had pushed our youth to death to garner votes." PM Modi termed the statement reprehensible. "Opposition is the natural habitat of terror apologists and questioners of our armed forces. This reprehensible statement by a senior leader like Ram Gopal Ji insults all those who have given their lives in protecting Kashmir. It humiliates the families of our martyrs," he said. Meanwhile, Uttar Pradesh Chief Minister Yogi Adityanath said Ram Gopal Yadav's comments were "big example of dirty politics" and an "attempt to demoralise" security forces. He said the remarks can weaken the morale of jawans. "He has questioned the sacrifices made by CRPF jawans. He must apologise for this comments." Such statements will lower the morale of soldiers and raise the morale of terrorist organisations, Adityanath claimed. On earlier occasion also, Akhilesh has accused the BJP of using the strike to "distract" people. "The soldiers were martyred and there was an intelligence failure (in the Pulwama attack). What have they (BJP) done for the Army men? People of the country want 'ann' (food) not gun," he had recently said.